The following exercises were designed to stretch the tight muscles around the concave side of the the scoliotic group of vertebra and to strengthen the muscle group on the convex side. Each patient has their own different level and angulation of scoliosis, it is not ideal to share these exercises among other patients with scoliosis of different level or stage might cause further hyper-mobility of the spines or aggravation of their condition. The exercises have to be performed with the parent or guardian to give stability to the hips. 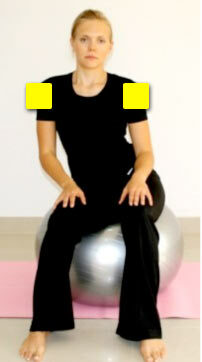 THE YELLOW MARK ON EACH PHOTO INDICATES THE AREA WHERE THE ASSISTANT’S HAND SHOULD BE PLACED. Sit on the ball with both feet flat on the floor. Start with both of your hands on the concave side RIGHT SIDE keeping the elbow straight then bring both of your hands across the midline, then up over your head. Hold for 10 seconds then repeat 10 times. Sit on the ball with both feet flat on the floor. Each hand is rested on each lap. Slowly move your hips toward LEFT SIDE. Hold for 10 seconds then repeat 10 times. Kneel on a mat, place both hands on top of the ball. Slightly tilt your upper body forward with both elbows straight then slowly roll the ball with both hands to the LEFT SIDE. Hold for 10 seconds then repeat 10 times. Kneel on the mat, both hands on the ball. Gently roll the ball in front keeping your elbow straight. Stop until your upper body is parallel to the floor. Then roll the ball slowly to the LEFT SIDE. Hold for 10 seconds then repeat 10 times. Lie on your RIGHT SIDE. With both knees straight and in line with the upper body, lift your upper body while resting on your elbow. Hold for 10 seconds then repeat 10 times. Lie on your LEFT SIDE, with both knees straight and in line with the upper body. Lift your upper body and both knees off the floor while resting on your elbow. Hold for 10 seconds then repeat 10 times. Lie on your LEFT SIDE. With both knees straight and in line with the upper body, lift your upper body and both knees off the floor while resting on your elbow. Raise your RIGHT ARM together with the movement. Hold for 10 seconds then repeat 10 times. Lie on your LEFT SIDE. With both knees straight and in line with the upper body, repeat the same movement in exercise 9 PLUS, raise your RIGHT LEG. Hold for 10 seconds then repeat 10 times. Stay in one corner of the room. 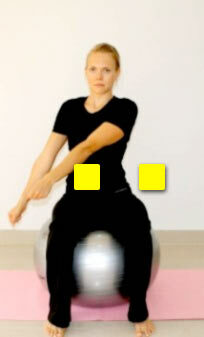 Rest your RIGHT HIP AND WAIST (concave side) on the ball. Both of your feet should be on the corner of the wall for added support. Keep both hands on the nape of the neck, gently lift your upper back upwards. Hold for 10 seconds then repeat 10 times.